A very quick and easy healthy slice for the whole family. If you don’t want nuts substitute for oats, dried apricots, dried apple. Place all ingredients into a food processor and mix well. Line a container or tray with cling wrap and pour mix in. Press down so that it is flat and then cover and place in fridge. When set, pull out cling wrap and cut into desired sizes. Store in fridge. Notes... I make this about once a week so always have one in the fridge. 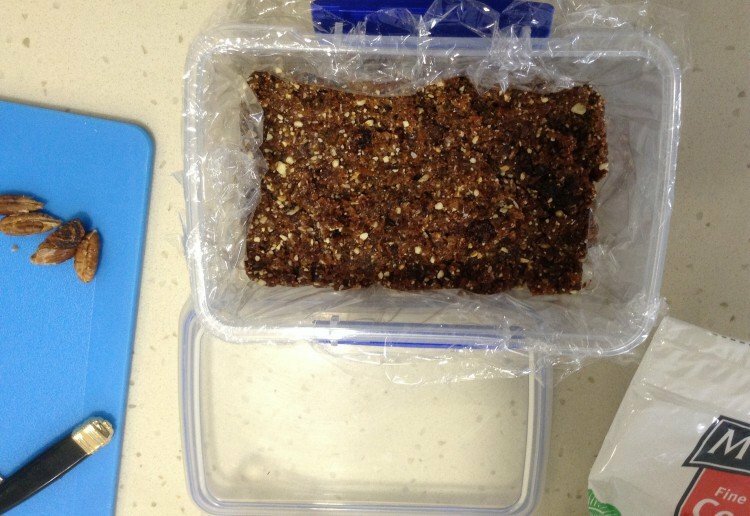 It's a great pre-gym snack or something to keep you satisfied until the next main meal. I love the cashews and dates in your slice,a delicious recipe! We tried this but made it into balls as that is what the toddlers wanted. Rolled them in extra coconut and without nuts was allowed into kindy treat time. What a easy recipe. I’ll be trying it this week. Yum, this looks so easy, and healthier than many alternatives. I love no bake recipes. thanks for sharing such an easy healthy recipe!! I love no bake recipes. thanks for sharing such an easy healthy recipe. I love these! So easy & they are a hit with the family. wow such an easy and healthy recipe – now if only it was that easy to get my husband to eat this!